Inside the cell nucleus, DNA is wrapped around histones (green) and is tightly packaged. In this image, the yellow glow on protruding histone ends represents epigenetic modifications that are associated with silenced genes by tightening the spool of DNA and histones. 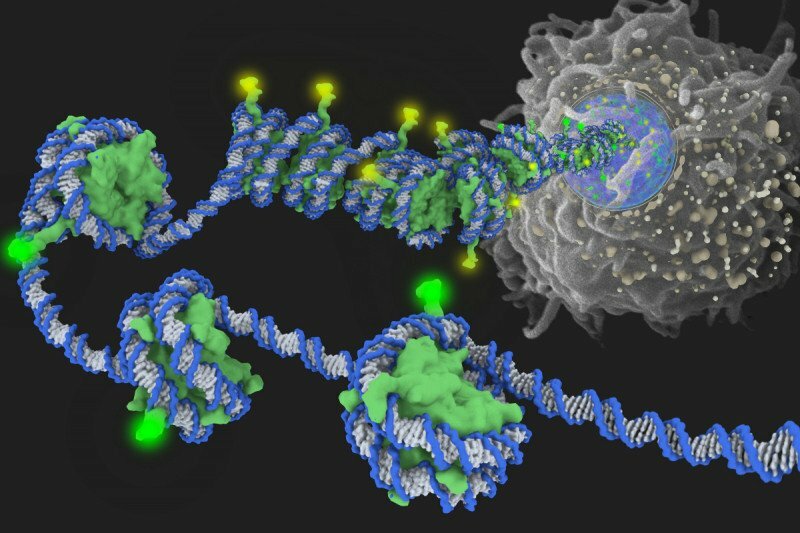 The green glow denotes modifications that relax the DNA strand, making the DNA accessible to transcription factors and polymerases. The Center for Epigenetics Research (CER) fosters inquiry in the rapidly growing fields of cancer epigenetics and epigenomics by bringing together Memorial Sloan Kettering scientists and clinicians with different areas of expertise — including basic science discovery, translational cancer research and drug development, and the transfer of new ideas into early-phase clinical trials. In October 2018, the Center welcomed Kristian Helin as its new Director. Epigenetics refers to chemical modifications of a cell’s genetic material that lead to changes in gene expression without altering the DNA sequence. Over the past few years, we have learned that epigenetic mechanisms play a critical role in the initiation, development, and progression of many types of cancer. Unlike genetic mutations, epigenetic states are in many cases reversible, which means it may be possible to manipulate them with drugs to interfere with tumor-promoting cell processes. The goal of the CER is to explore how epigenetic processes integrate cellular signaling and the metabolic state to influence cell proliferation, differentiation, and adaptation during both normal development and cancer. This research is providing new insights into cancer pathogenesis and unique opportunities for developing new therapeutic strategies.